Edited by Ronald Lawson with the assistance of Mark Naison. Replicated with the kind permission of the author and very gratefully reproduced from TenantNet who digitised it. This document including all associated files, may not be published, re-transmitted or otherwise reprinted without the prior written permission of Ronald Lawson. For such permission, contact Mr. Lawson by email at either rlawson@cloud9.net or law$ubst@qc1.qc.edu. 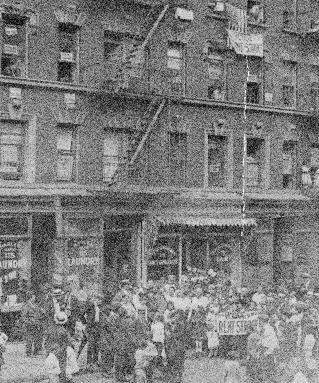 Striking tenants outside their Harlem building, September 1919. In the 1990's we secured permission from the author to put the entire book online. Please verify whether or not libcom.org also has permission from the author. Moreover, the pages on libcomm are lifted verbatim from TenantNet. Libcom.org did not seek permission from TenantNet to use its electronic conversion and formatting. Nor has Libcom.org given any credit to TenantNet for use of its electronic conversion. Please contact us as soon as possible regarding this issue.